Base of Operations: The Darkwood, U.S.A.
History: As a boy Patrick Wilding is the only survivor from a vicious attack by a band of Abenaki Indians that kill the rest of his family. Having survived he vows that he will get revenge. He grows up in the Darkwood forest and takes the name of Za-Gor-Te-Nay, "the Spirit with the Tomahawk". Having reached adulthood, Zagor locates the man who led the Abenaki Indians, and kills him, only to find out that the reason his family had been attacked was because his father had mercilessly slaughtered many indians whilst in the army. Wanting to break the cycle of revenge he vows to help the weak and oppressed no matter what race they come from, and to bring peace and justice to the forest. 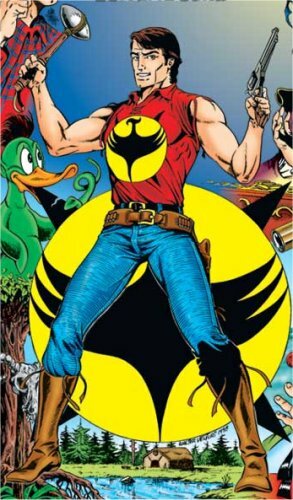 Comments: Zagor was created by writer Guido Nolitta (the pen name of Sergio Bonelli) and artist Galieno Ferri. The character has recently (2001) celebrated his fortieth anniversary. He is extensively published both in his native Italy and in Brazil. The name Zagor came from "Za-La-Mort", a hero of Italian silent movies, and (probably) Gordon (as in Flash Gordon) - prior to this he was going to be called "Ajax" until someone pointed out that this was the name of a household detergent. 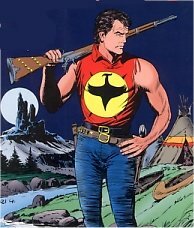 While the stories are vague as to the time period Zagor is set in, the authors have stated that it is between 1820 and 1840 - in spite of the fact that the gun he commonly used wasn't invented until 1860. The Darkwood from which he adventures is meant to be somewhere just south of the Great Lakes in America. Zago is often accompanied by his friend (and comic relief) Chico, a.k.a. Dom Chico Philip Cayetano Lopez y Matinez y Gonzales, a Hidalgo nobleman descended from Spanish conquistadors. Thanks for Raphael for providing his nickname "Lo Spirito con La Scure" and translating it properly for me.